Stop me if I’ve told you this, but the best thing (for me) about living in Barcelona is the ‘free furniture days’. I fear that is not the official term, I’m not sure there is an official term. Nevertheless, it is an amazingly exciting thing. Let me bring you up to speed peops. Every area has a day of the week when you can put out on the street any unwanted/broken pieces or furniture, or indeed anything else, for the council to come and collect. Naturally the more thrifty individuals choose these days to go ‘stuff-hunting’. I am firmly one such individual. In fact, when my flatmate told me of this phenomena, I was nearly sick and went straight out, literally eight hours too early (10pm is the optimum hour in my hood) , on the off chance that the early bird does indeed catch the worm. It didn’t. But I have honed the art, and in the style of Yardsale Bloodbath, here are some of my beauts. THE SEWING STASH. That’s right people, feast your eyes. And for the record, those reels of thread are just a fraction of what I picked up that night, which in turn was just a fraction of what was in the box. The little red things are size tabs. I have to be honest, the sewing machine is broken, but the high we achieved when we found it well out did the disapointment in discovering it didn’t work. I don’t remember EVER being that exicted in my whole life. Including the time when my dad told me we were going to a panto JUST AFTER seeing a panto piece on Blue Peter. Anyway, I’m hanging onto the machine in case I meet someone who can fix it. Maybe I’ll find one on the street! The mini-stash of buttons and hook and eyes were found in Gotico one day when I was feeling pretty down. Like Barcelona gave me a little gift and was saying ‘Cheer up love’. Thanks Barcelona, I have. My mother, whom, it could be argued, I unofficially employ as a cultural correspondent, keeping an eye out for interesting things whilst my attention is elsewhere, is pretty-bloody-awesome. She has just informed me of a new Coen Brothers film shortly to be released called Burn After Reading. So highly tuned are her skills, that she is able to acquire, assimilate and report such exciting and socially relevant news without even removing her fluffy slippers, and can do so on the way to putting the kettle on. Undeniably strong skills indeed. Remind me to give her a raise. Check the poster above. How nice is that!? Viewing the artwork only further ignited my excitement. But wait.......! Those colours, that font, the mysterious silhouette. Have we not seen this somewhere before? Perhaps if we were cast our minds back into the graphic design history of the late 20th century........ Ta da! 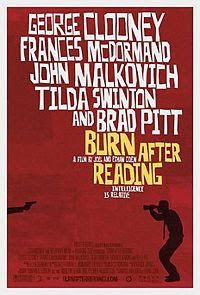 I'm sure the graphic designer who created the Burn After Reading poster was creating a deliberate reference, and subsequently I can hardly feel smug for making the connection. Next time you see me however, ask me to tell you the true story about when Jimmy Stewart was in the back of my Grandad's taxi.... It's a good one.